Olivia Barr joined the Law School as a Senior Lecturer in February 2016. She completed her LLB (Distinction) and BA (Anthropology and Philosophy) at the University of Western Australia, an LLM at the University of British Columbia, and a PhD at Melbourne Law School. Prior to returning to Melbourne, Olivia was a Lecturer at the University of Technology, Sydney. She has also worked as a government solicitor, in law reform, and for the United Nations Permanent Forum on Indigenous Issues. With Dr Karen Crawley (Griffith University), she is the Managing Editor of the Australian Feminist Law Journal: A Critical Legal Journal. Olivia writes in jurisprudence, and her cross-disciplinary work engages with geography, anthropology, philosophy, architecture and contemporary public art practices. 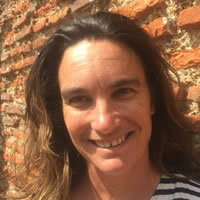 Her research focuses on questions of inheritance, especially ongoing relations between Anglo-Australian common law and Aboriginal law in Australia. Olivia recently published A Jurisprudence of Movement: Common Law, Walking, Unsettling Place (Routledge, 2016) in Routledge's 'Space, Materiality and the Normative' series. Her current research concerns questions of lawful place, and argues for greater attention to the place-making practices of law.